After successful installation there are some things worth knowing before starting the server. This article describes the key items. The startup sequence can be verified in the server.log and/or events.log. NOTE: Modules are deployed the first time the server is started which might take 30-300 seconds. The configuration interface won’t be available until this is complete! 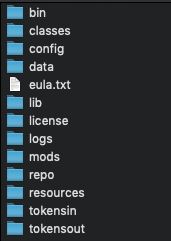 The folder structure after a installation should look like shown below. Base of this folder is referenced as phenixid server root. config – contains configuration files. The most important file is the boot.json file, the main bootstrap file. It contains the bare minimum to get the server started. The phenix-store.json contains most PhenixID Server settings. The log4j.xml file regulates the level of logging in the server. How logging works and is configured is described in detail in separate document which can be found here. mods – contains temporary data. Please do not add or remove anything from this directory if not instructed to do so by PhenixID support. data - holds the reporting data and additional "non system configuration". PhenixID server relies on a bootstrap file, boot.json. It contains initial configuration data used to start the server. File location must be <phenixid server root>/config and may not be changed . Changes to this file should only be done advised by PhenixID support or PhenixID documentation. After successful login four main headings are available. The start page is a dashboard for the PhenixID Server which will contain information about the installation, connections and most recent events. The Reports page provides a number of default reports on system events. It is possible to create custom reports. PhenixID Server ships with several scenarios to choose from. With these you will be able to create a number of configurations. Each scenario aims to quickly get admins going in terms of MFA. Typical usage is protecting a VPN login or web application SSO . Once walked through a scenario the result will be found under the heading selected. To edit or delete just select the scenario and all possible options will presented on screen. The Advanced page is a powerful module used when needing to move outside the capabilities of a Scenario. It gives a total control over the system configuration and is basically a way into the configuration file. Usage of this implies great knowledge about PhenixID server. When in doubt contact PhenixID support. PhenixID server relies on files and folders created during the installation process. Maintain backup of the installation root directory. A recovery simply means replacing the current files and folders with the data from last backup. Replacing single files or directories should only be done if advised by PhenixID support. How to remove the security checkbox "I am a human"